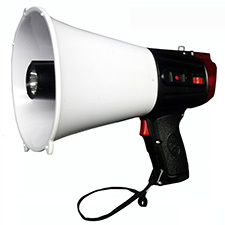 Recorder/Playback innovative new design, this all-in-one emergency megaphone features a powerful LED flashlight, colored flashing signal dome light, emergency siren and whistle. Along with the ability to record and repeat a ten-second message. Built around a high quality 20 watt Piezo Dynamic voice coil megaphone with omni directional microphone for clear enunciation.The unit is lightweight, durable and energy efficient. Requires 6 AA batteries (not included) with LED power level indicator. Use the Product tab above to instantly access any product by single clicking selections. Double click any selection to jump to that category.